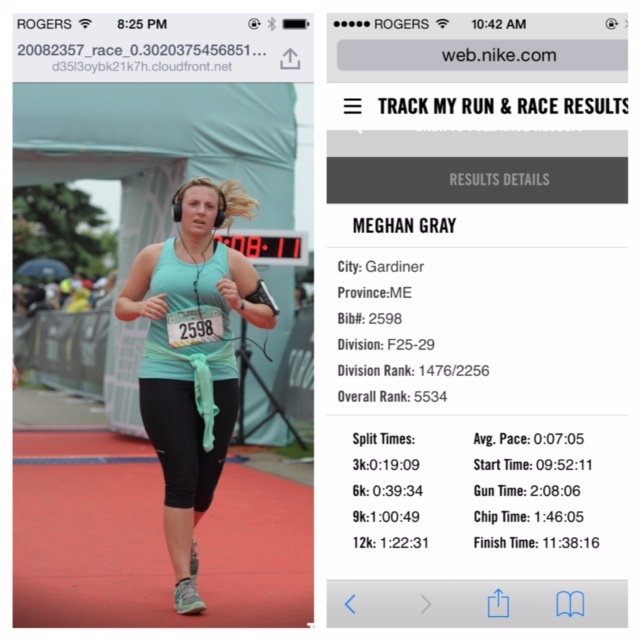 On Sunday, June 14 I took to the Toronto Islands with workout gear and my Nike Frees with two goals–completing the 15k course and receiving the beautiful Tiffany and Company finisher’s necklace as I crossed the finish line. 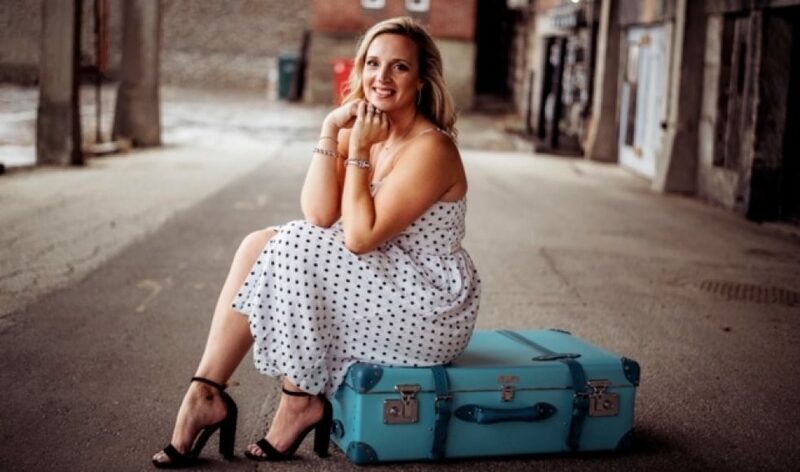 As a graduate student I was lucky enough to be guaranteed a spot through their student program. I have never run for than 6.3 miles at a time so signing up for a 15k was going to be a challenge for me. I will be honest, my training wasn’t as stellar as I had hoped and I was EXTREMELY nervous about the race and how my body would react. I kept telling myself I was only competing with myself and to keep a steady, safe pace of 10 -10:30 minutes per mile to ensure I didn’t reach a “gassed out” moment. I’ve run enough races to know that the adrenaline factor always goes into full force and this race wasn’t any different. The mile and K markers kept flying by me and before I knew it I was past the halfway point and ecstatic. As I neared the final three miles I had to keep giving myself some inner pep talks but it was all worth it. My body may have had a few aches and pains in the days following but I would do it all over again in a heartbeat. This race really taught me how strong our bodies are and how important it is to properly fuel them and stay active. I had such a moment of happiness and pride when I crossed the finish line and no one could take that away from me. I was a little concerned with how smooth the race would go considering 10,000 women (and a few men) were all on Toronto Island. I have to give some serious kudos to Nike because they put on a stellar race and pay attention to every small detail. So what made me sign up for the 15k? 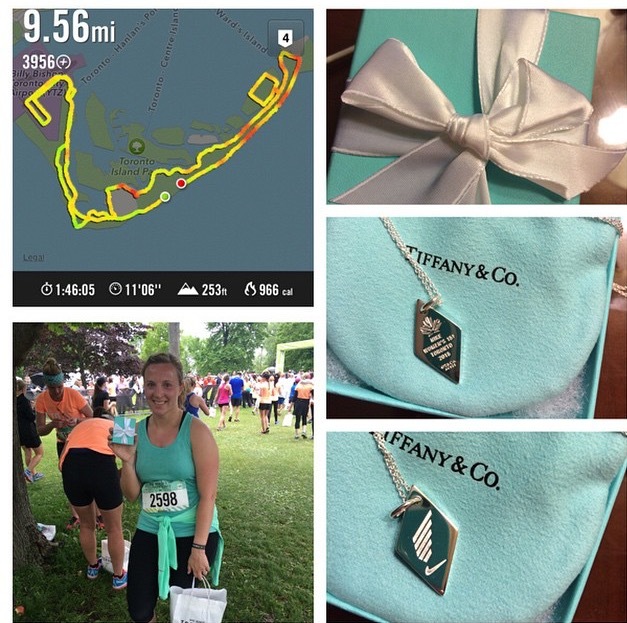 I will be honest it was knowing that when I crossed the finish line I would receive a beautifully wrapped Tiffany and Company box with a beautiful finisher’s necklace inside that I could wear proudly for years to come. I am in love with this particular necklace but I must say I got so much more out of the race than the necklace. In fact, I had such a wonderful time I’ve decided it’s time to up the challenge and I have signed up for the Nike San Francisco half marathon. Keep your fingers crossed for me that I get selected.